I created a box/crate in about fifteen minutes--very easy construction. I cut three boards about 15" long and attached the long sides to the bottom board. I then measured and cut and attached the end pieces. 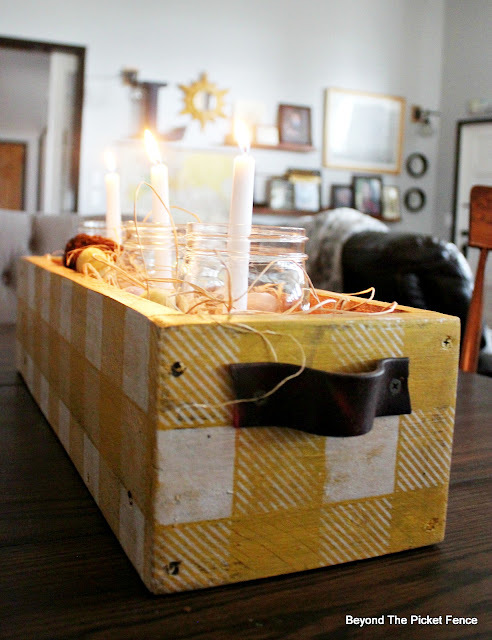 I painted the box yellow--I love yellow for spring and I am seeing a lot of it in clothing and decor. I stained over the yellow to darken and dirty it a little bit. I then stenciled in white the buffalo checked stencil from Funky Junk Interiors Old Sign Stencils. Checks and gingham scream spring to me so I decided the buffalo check stencil would be perfect. Some leather belt handles finished the box. 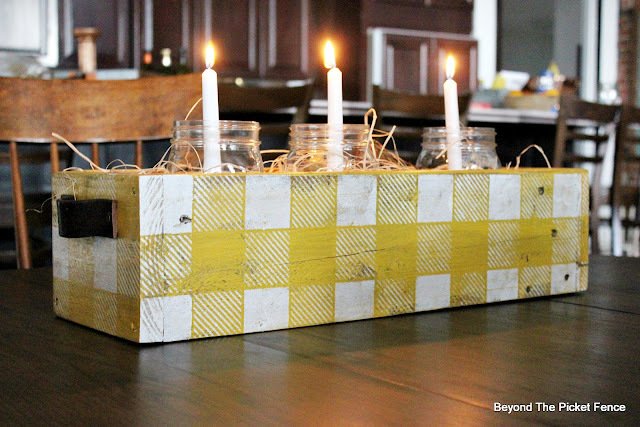 This box makes a great candle box for a centerpiece. I added some filler, a nest, and some eggs. 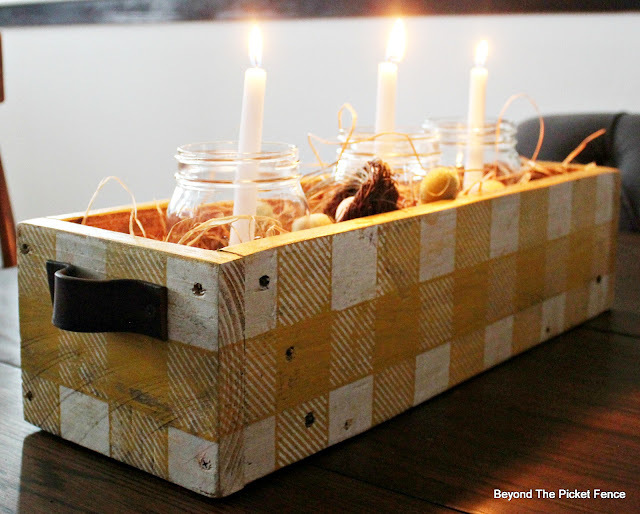 But it would also make a fun planter box, or would be cute in a bathroom to hold lotions and washcloths. I love the color and checkerboard design on your planter box. Fifteen minutes...Wow! 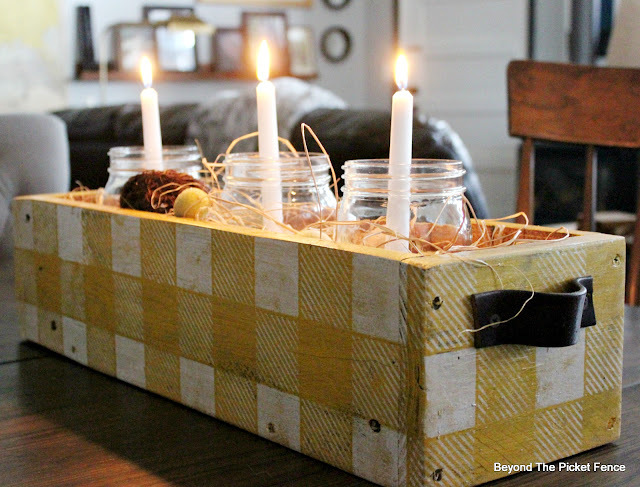 I think, like you, I'd use the box on the dining room table for the Easter season; then maybe in my craft room to hold supplies I want to keep close at hand. Great project! Thank you! The box would definitely work well in a craft room. 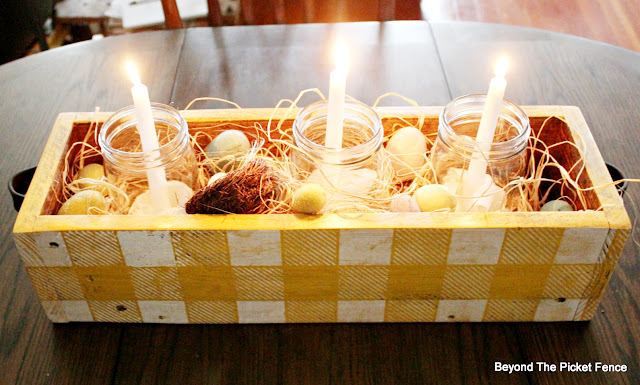 So pretty with the eggs and candlelight. What a sweet husband to prep boards for you! Once my husband brought home a solid built pallet for me, better than flowers, right? Yes! He knows my love language--pallet wood ;).